Bard StatLock Foley Stabilization Device - Adult is designed to minimize catheter movement and accidental removal. Foley catheters are prone to inadvertent pulling or tugging that can expose the user to a great deal of discomfort. StatLock Stabilization Device fixes this discomfort and is a more effective alternative and easier to use than tape and circumferential leg straps. 1. Place Foley catheter into the retainer. The directional arrow should point towards catheter tip, and the balloon inflation arm should be next to the clamp hinge. 2. Close lid by placing your fingers under the pad and pressing the grip markers at the end of the clamp with your thumb, being careful to avoid pinching the catheter. 3. Identify proper securement site by gently laying the Bard StatLock Foley catheter stabilization device straight on the front of the thigh, then back up one inch towards the insertion site. Make sure leg is fully extended. Gently place the StatLock Foley stabilization device off to the side, away from the selected securement site. 4. Cleanse and de-grease securement site with alcohol. Let skin dry. Be sure to clean area larger than securement site. 5. Apply skin protectant in direction of hair growth, to an area larger than securement site. Allow drying completely (10-15 seconds). 6. Using a permanent marker, write initials and date of application on StatLock anchor pad. NOTE: Always secure catheter into the StatLock stabilization device retainer before applying adhesive pad on the skin. 7. Align the device over securement site, leaving one inch of catheter slack between insertion site and the device retainer. Make sure leg is fully extended. 8. While holding the retainer to keep the pad in place, peel away paper backing, one side at a time, and place tension-free on the skin. 1. Open retainer by pressing release button with thumb, then gently lift to open. 3. Wipe the edge of the pad using at least 5-6 alcohol pads until a corner lifts. Then continue to stroke undersurface of the pad, in a back-and-forth motion, by squeezing the alcohol out to dissolve the adhesive pad away from the skin. Do not pull or force pad to remove. StatLock Foley stabilization device should be assessed daily and changed at least every seven days. If the pad becomes soiled, then wash with soap/water, saline or hydrogen peroxide. Do not use alcohol or prepackaged bathing systems, which could lead to early lifting. Evaluate skin integrity prior to application. Consult your healthcare professional about the removal of the StatLock stabilization device if you experience any shifts in the fluid input that may interfere with skin integrity. Do not use the Statlock adult Foley stabilization device where loss of adherence could occur, such as with a confused patient, unattended access device, diaphoretic or non-adherent skin, or when the access device is not monitored daily. Observe universal blood and body fluid precautions and infection control procedures, during the Statlock device application and removal. Catheter insertion site should be treated per established hospital policy and procedure. Minimize catheter manipulation during device application and removal. The Statlock device pad adherence and catheter/tube position should be routinely inspected. Thank you for reaching out to us. The StatLock Stabilization Device should be assessed daily and changed when clinically indicated, at least every seven days. Do you have sizes to fit a 26 size catheter? Thank you for your inquiry. 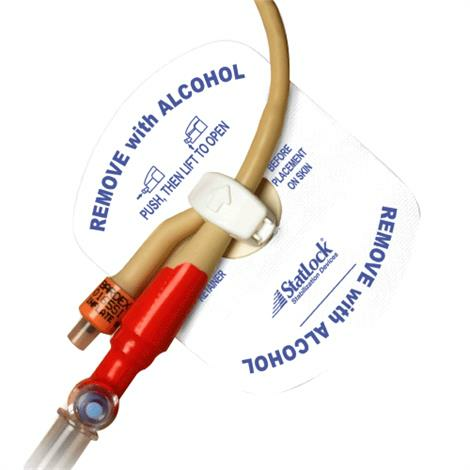 The Bard StatLock Foley Catheter Stabilization Device Accommodates both 2-way and 3-way latex 8–22 Fr. and silicone 6–26 Fr. catheters for the ultimate in versatility. Hope that helps. 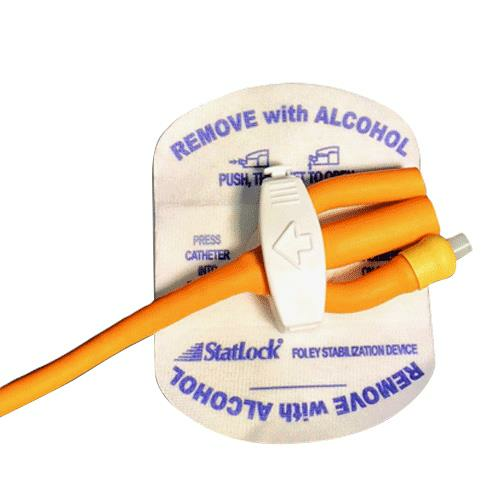 Can you use the Statlock Foley Stabilization device when pressure/tension is required in the catheter? Yes. Pressure/tension can be applied easily with STATLOCK® Foley stabilization devices. When placing the anchor pad on the anterior thigh, keep the hip slightly flexed to the angle that achieves the appropriate pressure/tension once it is extended. Test this before applying the STATLOCK® stabilization device to the skin, so the catheter is not too taut. Once the STATLOCK® stabilization device is secure and the patient extends his/her leg, the catheter will be taut, and the desired pressure/tensionis applied. You can remove it with the help of alcohol. You may refer to the product video for more information.